Acquisition History: The Department acquired the Pearly Lake WMA in 2017 using USFWS Wildlife Restoration Program funds. Description: The property has about 50 acres of wetland, ranging from small brooks to beaver ponds to marshland associated with Pearly Lake. It also contains 50 acres of fields. The rest of the property is comprised of white pine/red oak/red maple forest. The area includes about 3,500 feet of frontage on Pearly Lake, which is a shallow warmwater pond that supports bass, perch, and pickerel. Common Wildlife: Look and listen in the woods for scarlet tanagers, black-throated green warblers, veeries and a variety of other songbirds. Bear, deer, and hare are also common here. The fields will provide great foraging opportunities for deer and turkey. The indigo bunting and field sparrow are likely along field edges. Wetlands likely include wood duck, mallards, and perhaps woodcock along the shrubby edges. Directions: The property can be accessed from Ingalls Road and the Class VI portion of Bowers Hill Road. It can also be accessed from Old Rindge Road in Fitzwilliam. Special Notes: The Society for the Protection of New Hampshire Forests holds a conservation easement on the property, however, the easement did not guarantee public access and also contained a right for the construction of a single residence. 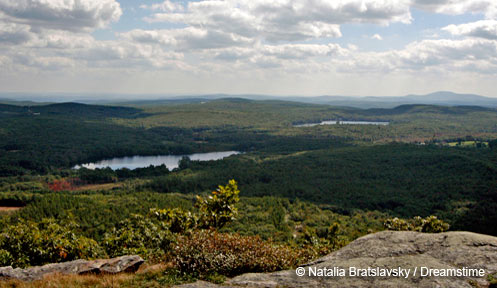 Now the right to public access for hunting, fishing, trapping, and other wildlife-related recreational activities is permanently protected and no development will ever occur here.